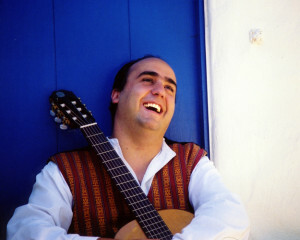 Juan L. Sánchez is a singer/songwriter, educator and artistic director of the Juan L. Sánchez Ensemble. He was born in Málaga, Spain in 1965 into a family with deep artistic roots that boasts dancers, flautists, trumpet players, pianists, and even an orchestra conductor and composer who played 17 instruments (his greatgrandfather). At the age of 8, Juan moved to Madrid, Spain where he studied solfége, choral singing, composition and violin at the Royal Conservatory of Music, while participating in a number of church and school choirs. At age 17, he decides to quit his formal music training (to his mother’s dismay!) and devote himself to the study of English Philology at Complutense University in Madrid. During the following 5 years he teaches himself guitar and travels extensively throughout Europe, working for 2 summers in Germany, attending both Friedrich Wilhelm Univeristät in Bonn and the Interuniversity Center in Dubrovnik, Croatia. He also visits Turkey, Morocco, Austria, France and Italy, quickly falling in love with their folklore. Upon completion of his Bachelor’s degree, he obtains scholarships to Stetson University in Florida, where he studies musical theater and voice, and UCLA, where he completes his MA in Applied Linguistics.In 1989 he moves to Monterey, where he works for 7 years as a bilingual elementary school teacher. It is also during that time that he starts writing his first original compositions. He assembles Trova Latina, a Latin American Folk quartet that performs in coffeehouses, libraries and schools in the area. In 1997 he founds the Juan L. Sánchez Ensemble, with an exceptional and eclectic group of musicians well-versed in Jazz, Middle-Eastern and Latin music from the Monterey Bay region. They release their first album Cosmopolita that year and start touring nationally shortly thereafter. In 2004, they launch their second release: Hijos de la Tierra (Children of the Earth), dedicated to all farm workers around the world. In 2008 Juan L. Sánchez moves back to Spain for two years, working as a children’s entertainer/storyteller and performing with a Moroccan/Spanish project named El Jardín de la Sultana/The Sultaness’ Garden. In 2012, he releases his first solo album for children and families entitled Canta Conmigo/Sing with me in Spanish, which has been widely praised by parents and educators alike. Today, Juan continues his work as children’s performer and artistic director of the Juan L. Sánchez Ensemble, and as a lecturer at the Service Learning and Music and Performing Arts Institutes at CSU Monterey Bay. "Music without borders for a world without borders"